There aren’t that many movies about a father and a son working on their relationship. Finding Nemo is really the only one for a kid I can think of outside of today’s pick and that’s a real shame. Boys need stories that teach them about their Dads and help them to understand their perspective. (Granted most animated films the leads are orphans but still!). Anyway, it is it’s this father son dynamic that perhaps make The Goofy Movie such a special film in the Disney catalog of films. Made by the usually schlock-masters Disneytoons, A Goofy Movie is simple yet effective. It takes the characters from the Goofy based animated series at the time and gives them their own movie. Of course, Goofy is the lead and he is the Dad to a boy named Max. Goofy wants nothing more than to have a great relationship with his son but Max, like most teenagers, is very resistant. Max would rather be focusing on his favorite rock band called Powerline and he tries to impress his crush Roxanne at a school talent show. Unfortunately for him, Goofy insists he not go to the concert and go on vacation with him instead. On a road trip they start and they even have a few songs on their way. I love a scene when Goofy takes Max to a hoe-down at a opossum park and Max finally loses it. As silly as the characters might look there is real heart to their scenes together. And that’s what makes A Goofy Movie really work- it’s the relationship between Goofy and Max. Goofy is very heartsick over his inability to relate to his son. He is devastated. Plus, he compares his relationship to Pete and PJ which seem to have everything figured out. What parent can’t relate to that? But it’s not all somber thoughts on parenting. We have scenes where the car makes it into the Colorado River and another where Goofy ends up fishing for Big Foot. It’s a family vacation like most families have but amped up a bit! It’s really hard sometimes for Dads to express their love for their children and I think Goofy and Max’s relationship could help encourage discussion in families and provide some laughs as well. It’s just a sweet little movie. All the voice work is on point including Bill Farmer as Goofy, Jason Marsden as Max, Rob Paulsen as PJ and Jim Cummings as Pete. Wallace Shawn, Pauly Shore and Pat Caroll can all be heard as well. The animation also looks nice and I like the songs. Even the Powerline songs are ok for the 90s type rock music. But my personal favorites are After Today and On the Open Road, which have a bit of a Broadway feel to them. It’s also kind of fun to see Disney in a modern setting. With the exception of Big Hero 6, Lilo and Stitch and Oliver and Company most Disney films are in fairy tale or creative settings. The Goofy Movie has a hot tub and a vacuum. Modern, everyday items you typically don’t see in a Disney film. It’s also not the most tidy ending with both Goofy and Max compromising and learning from each other. That’s great! 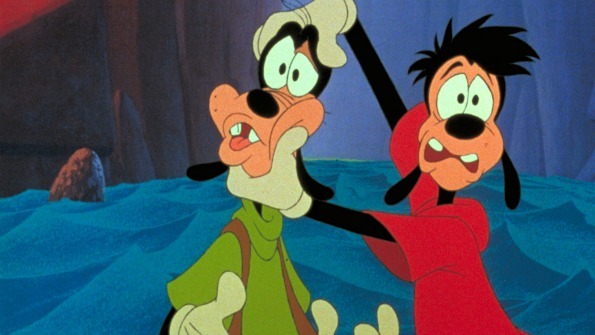 I think if you give Goofy Movie a shot you will find it is a very enjoyable film for you and your family. I also have previously reviewed An Extremely Goofy Movie which is not well regarded but I like it. This is better but I like that one as well. (Originally this Family Movie Night was going to be all streaming movies but I’ve moved away from that). So give both movies a try and enjoy! Let me know what you think about A Goofy Movie. Is it one that you watched growing up or have you never seen it? Put in the comments section below. Thank you! And have fun on your own vacations wherever they may take you.